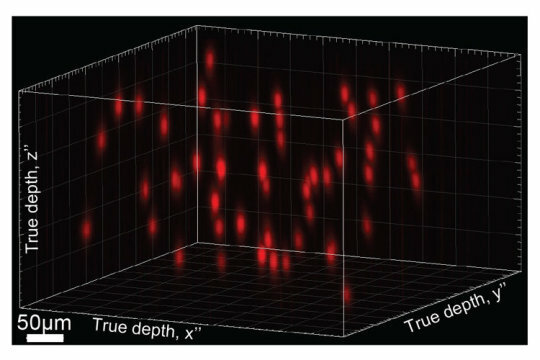 To focus the light onto just the cell body -- a target smaller than the width of a human hair -- of nearly all cells in a chunk of brain, they turned to computer generated holography, a method of bending and focusing light to form a three-dimensional spatial pattern. The effect is as if a 3D image were floating in space. "The major advance is the ability to control neurons precisely in space and time," said postdoc Nicolas Pégard, another first author who works both in Adesnik&apos;s lab and the lab of co-author Laura Waller, an associate professor of electrical engineering and computer sciences. "In other words, to shoot the very specific sets of neurons you want to activate and do it at the characteristic scale and the speed at which they normally work." The researchers have already tested the prototype in the touch, vision and motor areas of the brains of mice as they walk on a treadmill with their heads immobilized. While they have not noted any behavior changes in the mice when their brain is stimulated, Mardinly said that their brain activity -- which is measured in real-time with two-photon imaging of calcium levels in the neurons -- shows patterns similar to a response to a sensory stimulus. They&apos;re now training mice so they can detect behavior changes after stimulation. The area of the brain covered -- now a slice one-half millimeter square and one-tenth of a millimeter thick -- can be scaled up to read from and write to more neurons in the brain&apos;s outer layer, or cortex, Pégard said. And the laser holography setup could eventually be miniaturized to fit in a backpack a person could haul around. Mardinly, Pégard and the other first author, postdoc Ian Oldenburg, constructed the holographic brain modulator by making technological advances in a number of areas. Mardinly and Oldenburg, together with Savitha Sridharan, a research associate in the lab, developed better optogenetic switches to insert into cells to turn them on and off. The switches -- light activated ion channels on the cell surface that open briefly when triggered -- turn on strongly and then quickly shut off, all in about 3 milliseconds, so they&apos;re ready to be re-stimulated up to 50 or more times per second, consistent with normal firing rates in the cortex.